Jim Donelon, Louisiana Commissioner of Insurance, has published his 2010-2011 annual report. For those interested in the effort to ensure underserved communities have access to affordable and appropriate insurance products, the report contains some unfortunate data. For starters, page 30 shows that over half of those applying for a license to sell insurance in Louisiana will fail. Why is this a problem? It's a problem because research by LIMRA and others (including CFS) shows contact with an agent is perhaps the single biggest difference between those who purchase a product like life insurance and those who have the means but do not. If we want to help more families achieve financial security, we must make sure all communities have access to qualified financial professionals. Page 32 has more puzzling information. The report shows that just 62 percent of those with a college degree who take the LA life agent exam pass. Consider, for a moment, that in most states, over 70 percent of ALL candidates pass the exam. 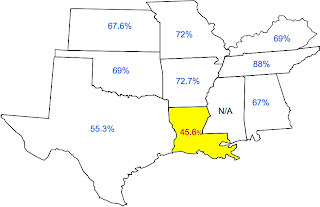 What is it about the Louisiana exam that has even college graduates struggling? Finally, the report also includes pass rates by race/ethnicity. Looking at Table 15, one can see that those most likely to work in underserved communities are the least likely to get a license. The report is a wake up call. Like what we saw in the Texas post, numbers like this do not have to exist. Other states have found ways to encourage more entrance into the profession without sacrificing consumer protection. Remember the words of the Ohio Insurance Commissioner? Ensuring fairness in licensing is in the best interest of consumers, job-seekers and society. No no benefits when the pool of financial professionals is artificially and arbitrarily kept small. 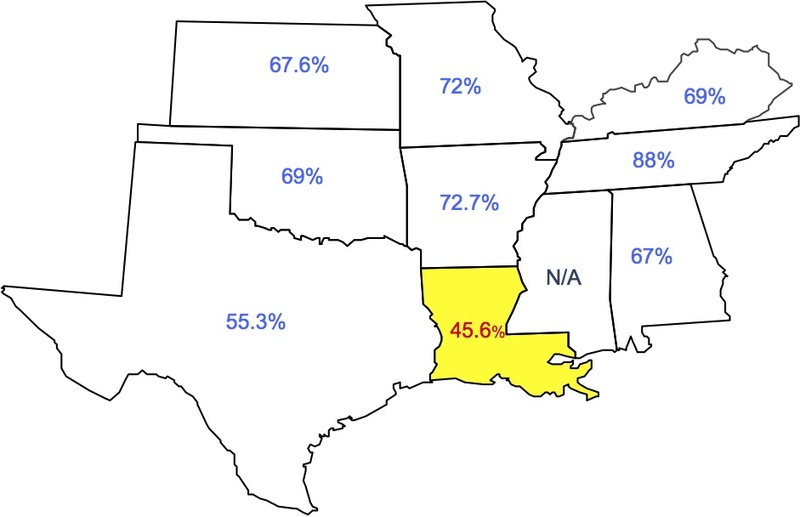 Looking below at how Louisiana's pass rate stacks up against the rest of the region, one can't help but wonder if Louisiana regulations - like regulations we discussed in Texas - have gone too far and are hurting consumers, job-seekers and small businesses?